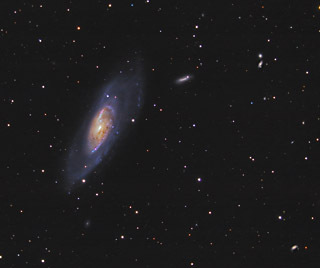 M106 is an X-Ray emitting Seyfert galaxy about 25 million light years from us. Most likely, the x-ray emissions are telling us that part of this galaxy is collapsing into a black hole. 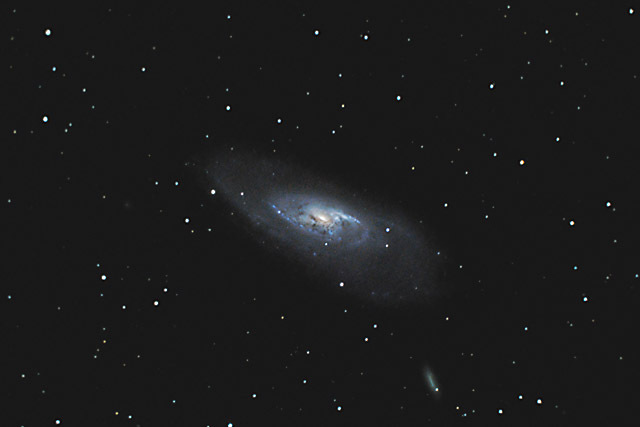 This image readily shows the galaxy NGC 4248 at about 5 o'clock. In this photo, North is to the Right. This image is cropped to 73% of the original full frame. Software Used Images Plus 4.0 for camera control, calibration, stacking and digital development. Photoshop CS5 used for flat fielding, black point, white balance, saturation adjustments, screen mask invert, high pass filter. Noise Ninja used for noise reduction. Notes For this exposure, I was using my original Schaefer homemade drive corrector. This drive corrector had problems, as the slowest speed to which I could adjust was running slightly fast. Also, the slow button didn't work, so I was limited to 30 second subexposures before the drift in Right Ascension caused the stars to be too out of round. I reprocessed this image on 12/11/11using improved techniques I've learned in order to bring out the outer galaxy halo and improve the colors.